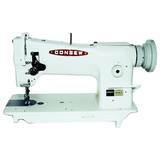 For over 100 years Consew has consistently designed and manufactured some of the most reliable machines in the sewing industry. Established in 1898, Consew has grown to become one of the most varied suppliers in the sewing industry. You can find sewing, cutting, pressing equipment, and an extensive line of sewing related supplies with this company. Everything from specialty machines that are capable of sewing parachutes, boat sails, and webbing to standard walking foot machines for upholstery are manufactured by Consew. Experience what it's like to sew leather, canvas, shoes, saddles, mattresses, tents, tarps, jeans, and other garments with a Consew sewing machine today!